Hickory is the common name for any of the deciduous trees comprising the genus Carya of the Juglandaceae family, characterized by pinnately compound leaves, flowers in the form of small catkins, and fruits in the form of large, hard-shelled nuts, with edible seeds, enclosed in a fleshy, four-valved husk that splits open at maturity. Reflecting the concept of bi-level functionality, members of this taxonomic group not only advance their own survival, reproduction, and so forth, but also provide a function for the ecosystem and for humans. Ecologically, the high-protein, high-fat nuts of hickory trees provide an important food resource for many animals, including birds, squirrels, deer, raccoons, and rats. In turn, many of these animals also serve as dispersal agents for the trees, spreading the nuts so that their seeds can germinate some distant from the parent tree. For humans, various hickories provide culinary and commercial values. The nuts of the shagbark hickory (Carya ovata), pecan (Carya illinoinensis), and shellbark hickory (Carya laciniosa) particularly are prized for food use. Hickory wood, with a reputation for strength, resilience, and shock resistance, is used for a number of purposes, including tool handles, bows, wheel spokes, the bottom of skis, and so forth. Furthermore, hickory is a prized wood for smoke-curing meats and barbecues. Hickories (genus Carya) are members of the walnut family, Juglandaceae. Members of Juglandaceae have large aromatic leaves, which are usually alternate, but opposite in members of Alfaroa and Oreomunnia. The leaves are pinnately compound, or ternate, and usually 20 to 100 centimeters long. The trees are wind-pollinated, the flowers usually arranged in catkins, and the fruit is a true botanical nut. There are eight genera in the family, including the commercially important nut-producing trees walnut (Juglans) and hickory (Carya), the later including the commercially important pecan (Carya illinoinensis). The Persian walnut, Juglans regia, is one of the major nut crops of the world. Walnut and hickory are also valuable timber trees. The genus Carya (from Ancient Greek κάρυον "nut") includes 17 to 19 species of deciduous trees with pinnately compound leaves and large nuts. A dozen or so species are native to North America (11–12 in the United States, 1 in Mexico), and 5–6 species from China and Indochina. Another Asian species, beaked hickory, previously listed as Carya sinensis, is now treated in a separate genus Annamocarya, as Annamocarya sinensis. Hickory flowers are small yellow-green catkins produced in spring. The flowers are wind-pollinated, and monoecious, with staminate and pistillate catkins on the same tree. As characteristic of the plant family, the hickory fruit is a true nut in the botanical sense. That is, it is a simple dry fruit with one seed in which the ovary wall becomes very hard (stony or woody) at maturity, and where the seed remains unattached or unfused with the ovary wall. The fruit is a globose or oval nut, 2 to 6 centimeters long and 1.5 to 3 centimeters in diameter, enclosed in a four-valved that splits open at maturity. The nut shell is thick and bony in most species and thin in a few species, including C. illinoinensis (pecan); it splits apart when the seed germinates. In the APG system, genus Carya (and the whole Juglandaceae family) has been recently moved to the Fagales order. Two of the most important commercial species are the pecan and the shagbark hickory. Pecan. Pecan is the common name for a large, North American deciduous hickory tree, Carya illinoinensis, characterized by deeply furrowed bark and an edible nut. The pecan grows to 20 to 40 meters in height, with a trunk up to 2 meters in diameter. The leaves are alternate, 40 to 70 centimeters long, and pinnate with 9 to 17 leaflets, each leaflet 1 to 2 centimeters long and 2 to 7 centimeters broad. The male catkins are pendulous, up to 18 centimeters long; the female catkins are small, with three to six flowers clustered together. 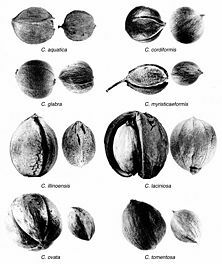 The pecan fruit is an oval to oblong nut, 2.6 to 6 centimeters long and 1.5 to 3 centimeters broad, dark brown with a rough husk 3 to 4 millimeters thick, which splits off in four sections at maturity to release the thin-shelled nut (FNA; OBS; Collingwood et al. 1964). It is native to south-central North America, including in the United States and in Mexico. Shagbark hickory. 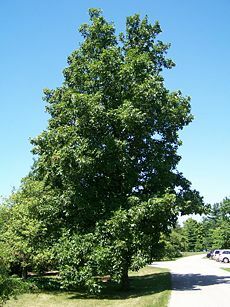 The shagbark hickory (Carya ovata) is a common hickory in the eastern United States and southeast Canada. It is a large deciduous tree, growing up to 27 meters tall, and will live up to 200-years-old. Mature shagbarks are easy to recognize because, as their name implies, they have shaggy bark. This character is however only found on mature trees; young specimens have smooth bark. The leaves are 30-60 cm long, pinnate, with five (rarely three or seven) leaflets, the terminal three leaflets much larger than the basal pair. The flowers are small wind-pollinated catkins, produced in spring. The fruit is an edible nut, 2.5 to 4 centimeters long with a green four-valved cover, which splits off at maturity in the fall, and a hard, bony shell. The nuts of hickory trees, being high in proteins and fats, provide an important food resource for many animals, including birds, squirrels, deer, raccoons, and rats. Many of these animals also serve as dispersal agents for the trees, spreading the nuts so that their seeds can germinate some distant from the parent tree. Blue jays are the major avian dispersal agent for pecans, while the eastern fox squirrel is the major mammalian dispersal agent for pecans (Sparks 2005). the Coleophora case-bearers C. laticornella and C. ostryae. Another insect that uses the hickory tree as a food source is the hickory leaf stem gall phylloxera (Phylloxera caryaecaulis). Phylloxeridae are related to aphids and have a similarly complex life cycle. Eggs hatch in early spring and the galls quickly form around the developing insects. Phylloxera galls may damage weakened or stressed hickories, but are generally harmless. Deformed leaves and twigs can rain down from the tree in the spring as squirrels break off infected tissue and eat the galls, possibly for the protein content of the phylloxera, or possibly because the galls are fleshy and tasty to the squirrels. Nuts from the pecan trees are a popular food. The nuts of some species of hickory are palatable, while others are bitter and only suitable for animal feed. The shagbark hickory (Carya ovata) and the shellbark hickory (Carya laciniosa), along with the pecan (Carya illinoinensis), are regarded by some as the finest nut trees. The shagbark hickory nuts are edible with an excellent flavor, and are a popular food among those who know them. The trees bear too seldom for them to be grown commercially. 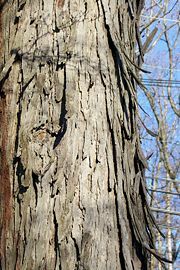 A bark extract from shagbark hickory is also used in an edible syrup that is similar to maple syrup, with a slightly bitter, smoky taste. Pecans also are major food item, whether eaten fresh or used in preparations of other dishes, such as pecan pie or praline candy. When cultivated for their nuts, note that because of their self-incompatibility, clonal (grafted) trees of the same cultivar cannot pollinate each other. Two or more cultivars must be planted together for successful pollination. Seedlings (grown from hickory nuts) will usually have sufficient genetic variation. Hickory wood is extremely tough, yet flexible and shock resistant, and is valued for tool handles, bows (like yew), wheel spokes, carts, drumsticks, lacrosse stick handles, golf club shafts (sometimes still called hickory stick, even though made of steel or graphite), the bottom of skis, walking canes, and so forth. They also have traditional use for punitive purposes as a switch or switch (rod) (like hazel), and especially as a cane-like hickory stick in schools. Baseball bats were formerly made of hickory but are now more commonly made of ash. Hickory is sometimes used for hardwood flooring due to its durability and character. Hickory is also highly prized for wood-burning stoves, because of its high caloric content. Hickory wood is also a preferred type for smoke curing meats. In the Southern United States, hickory is popular for cooking barbecue, as hickory grows abundantly in the region, and adds flavor to the meat. Shagbark hickory wood is used for making the bows of Native Americans..
Collingwood, G. H., W. D. Brush, and D. Butches (Eds.). 1964. Knowing Your Trees, 2nd ed. Washington, D.C.: American Forestry Association, Washington, DC. Flora of North America (FNA). n.d. Carya illinoinensis. Flora of North America Vol. 3. Retrieved April 13, 2008. Oklahoma Biological Survey (OBS). n.d. Carya illinoinensis. Oklahoma Biological Survey. Retrieved April 13, 2008. Sparks, D. 2005. Adaptability of pecans to its native range. HortScience 40: 1175-1189. Retrieved April 13, 2008. Stone, D. E. n.d. Carya Nuttall, Gen. N. Amer. Pl. 2: 220. 1818. Flora of North America Vol. 3. Retrieved June 3, 2008. Comparison of eastern North American hickories at bioimages.vanderbilt.edu. Comparison of hickory nuts at bioimages.vanderbilt.edu. This page was last modified on 24 December 2017, at 20:09.